Cognitive Behaviour Therapy - A Bad Rep? CBT has gained something of a bad rep of late. But some people swear by it and there's an awful lot of research suggesting it helps those with fatigue. CBT aims to change the negative thinking patterns that cause negative behaviours. It analyses the way we perceive events and leads us away from interpreting them negatively. Reading this, and looking beyond the psycho-jargon, you can understand the growing suspicion. The idea that thoughts are to blame for fatigue seems to imply that fatigue is 'all in the head'. This is clearly untrue, as outlined in the long list of fatigue causes by our resident doctor. Really, the point seems to be that we should be more aware of our thoughts and actions, without obsessing over every little detail. And, more importantly, we need to learn what positive behaviours we should be choosing. You may feel the best tactic is to ignore fatigue and battle on. With more activity you’ll eventually feel better. Pushing yourself will blow away the Fatigue-Dimension like smoke. You’re a fighter. You’re a winner. Grrr. No! This is one of those unhelpful patterns of thought and behaviour that CBT is made for. Fatigue is not something you can fight. Yes, you can slowly increase your activity day to day, but running roughshod over its feelings will only make matters worse. Fatigue is different from usual tiredness. If you battle on regardless for days or weeks, you’re going to find yourself in a boom and bust situation. You’ll keep going until you just can’t continue anymore. You’ll go energetically bust, so wiped out you’ll need a break to recover. I've seen people return to full time work too soon, only to be shattered and have to take months to recoup all the energy they couldn’t spare to give away. Slow but steady steps are the answer. Finding yourself in fatigue’s Goldilocks Zone – that moment when your activity and energy levels are ‘just right’ – can feel an impossible target. You don’t want to exhaust yourself by doing too much, but you must still strive to achieve something - you don’t want to feel like you’re wasting your life away! Three Good Things is a strategy that makes you feel like you are daily achiever. 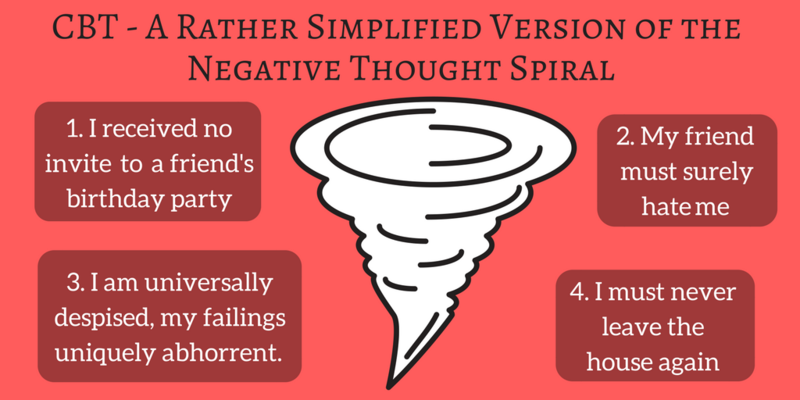 It may prevent the negative thought processes that inspire the boom and bust mentality. Always keep some energy in reserve – about 25% of your energy store. Activities will crop up that you weren’t expecting: dropping off children, unexpected milk-runs. Sit down before you fall down! 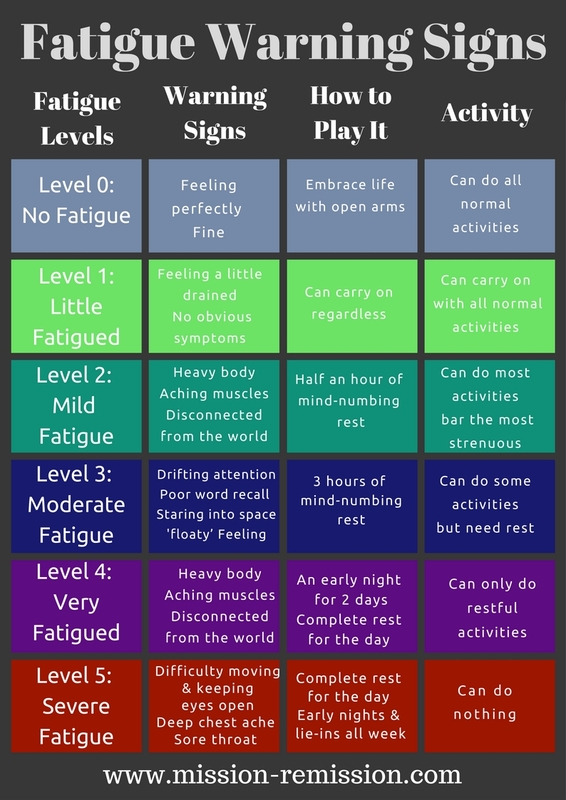 Yawns, drooping eyes, aching limbs - these are fatigue warning signs and by understanding and listening to them, the bust stage can be avoided. Symptoms can be tiered by severity: a few yawns won’t signal the same level of fatigue as sickness, or breathing difficulties. I’ve tiered my own warning signs, but symptoms can differ slightly from person to person.